Having trouble deciding which V2 Flavor Cartridge to try? If you have one of V2’s starter kits, the 10 flavor v2 Cigs cartridge sampler is a great way to experience their different available cartridge flavors. V2 Flavor e-cigarette Cartridges are compatible Electronic Cigarettes that have a KR808-D1 thread. With a built in atomizer in every V2 flavor cartridge, you can enjoy a maintenance free electronic cigarette experience. A V2 flavor cartridge comes pre-filled with enough of V2 Cigs e-liquid to produce between 150-250 flavor rich puffs dependent of course on how you like to vape, whether you’re a heavy hitter or not. The V2 10-Flavor E-Cigarette Cartridge Sampler is no longer available as V2 cigs has closed for business. Each V2 Flavor Cartridge contains a built in atomizer, so there is no cleaning or maintenance required. Every V2 flavor cartridge is filled with enough of our proprietary vapor liquid to produce between 150 – 250 puffs (dependent upon deepness of puffs). Each cartridge provides roughly the same number of puffs as a traditional pack of tobacco cigarettes. To use your V2 electronic cigarette, simply screw a flavor cartridge on to the end of a V2 e-cigarette battery and puff on it like you would with a normal cigarette. If you are using a V2 Automatic Battery, when you draw air through the V2, the heating element will automatically activate and produce inhalable vapor containing your chosen strength of nicotine and selected flavoring compounds. With our Manual Batteries, simply hold down the small rubber button on the body of the e-cigarette to activate atomization. You’ll know when a cartridge is used up when the vapor becomes weak and has a burnt taste. Cartridges are disposable and can be discarded at this time. Just screw off the old cartridge and screw on a fresh one — it’s that simple! Store your V2 Flavor Cartridges in a cool dry place. Cartridges should stay fresh for at least six months from purchase. Want to try each V2 Cigs Vapor Flavor? 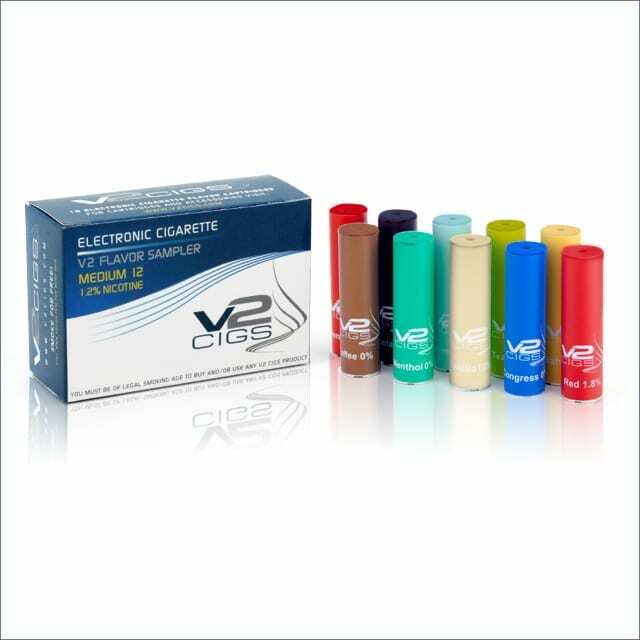 The v2 Cigs Flavor Sampler contains 10 Flavor Cartridges in each of our popular e-cig flavors; V2 Red, Sahara, Congress, V2 Menthol, Peppermint, Green Tea Menthol, Cherry, Coffee, Vanilla, and V2 Cola. V2 Flavor Samplers are available in five nicotine strengths: 2.4% nicotine, 1.8% nicotine, 1.2% nicotine, 0.6% nicotine and 0% nicotine. V2 Flavor Cartridges are the fuel for your V2 electronic cigarette. Each cartridge provides roughly the same number of puffs as a pack of tobacco cigarettes, so you are purchasing the equivalent of ten packs of cigarettes for a very affordable price. Unlike many e-cigarette brands, each V2 electronic cigarette Flavor Cartridge contains a disposable atomizer, so you never have to use the same atomizer twice. This provides a more sanitary vaping experience that requires no special cleaning. Just screw on and go! V2 Flavor Cartridges are compatible with all KR808-D1 threaded Electronic Cigarettes. The cartridge contains our proprietary solution of nicotine (or non-nicotine), water, food flavorings and propylene glycol (an FDA approved inhalant and food additive).